Dental Implants are a very popular and fast growing treatment option for replacing missing teeth. They are a wonderful and predictable alternative to replace missing teeth to restore form, function, aesthetics, and phonetics. This could be in the form of replacing one tooth, multiple teeth, or the whole upper or lower arch. They can also be used to firmly stabilize a ‘wobbling’ denture, allowing the patient to bite on a crunchy apple with confidence! With the changing lifestyle, our body has also become very sensitive and much more prone to damage and infections. But, with the same lifestyle mankind has done a lot of progress in each field including dentistry. 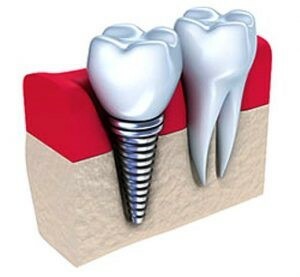 Dental implants are one of those gifts that have become popular within a very small span of time. They are usually used for patients who have lost teeth due to an injury, accident or for other common reasons. We here at Family Dentist In Richmond Hill excel in providing dental implants for the patients of all age groups in the simplest way possible. Dental implants are very popular today and one of the best alternatives for replacing any missing tooth you have. Our proven procedures can help in replacing as many teeth as required for a single person. Before the procedure begins, patients will be evaluated for determination of the bone quality which is essential for the process of bone augmentation. Bone augmentation is done before the implant therapy. Gums and tissues are thoroughly checked for prerequisites of aesthetic success. Once everything is done, the mouth is then ready for an implant. Once, the implant has been taken place, it takes 4-6 months to heal while the osseointegration occurs. You will also get a complete consultation and examination with the help of radio graphic diagnostic tools to know more about the anatomy of the site along with panoramic X rays and CT-scans. Aside from this, we advise and consult patients, through the entire process of internal healing is completed, you must visit your dentist every now and then for a routine checkup. This will ensure that your implant is all set to be a part of your mouth. We at Centre Dental Office are equally concerned about the post-implant conditions of all our patients. Always. There are typically several options available and are patient specific, so we would be happy to discuss with you your goals and what solution is best suited for your individual case with the highest success rate in the safest manner. You can count on Centre Dental Office, your Dental Implants Dentist Richmond Hill.